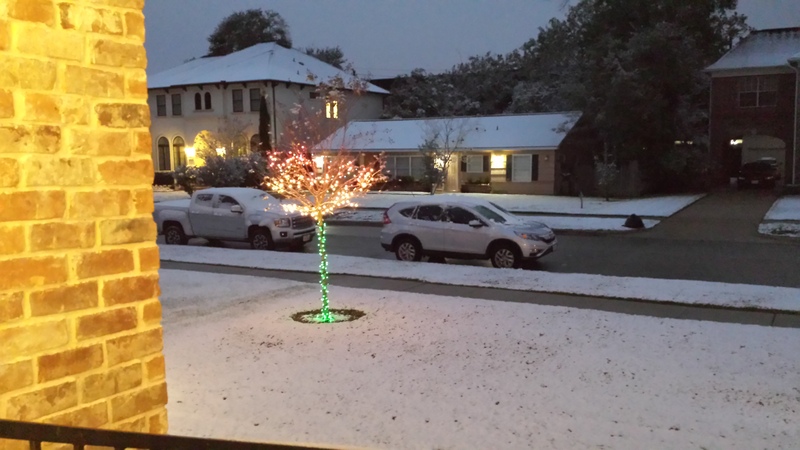 Houston area residents are enjoying a rare sight —a blanker of snow on the ground this morning. The snow flurries and sleet fell late Thursday night. Local forecasters say the overnight snow won’t last long and be gone by 9 a.m. today. Above, last night’s snow flurries mixed with sleet in the Bellaire, Texas in southwest Houston and the snow this morning. Freezing temperatures and icy conditions on the roads were reported this morning in the Houston area. However, no snow day off for Houston and Spring school district students as temperatures warm up and the snow melts. This entry was posted in Houston News, Travel, Weather and tagged Snow and Sleet in Houston. Bookmark the permalink.